I don't remember how I came across this recipe but I just had to share it. Everywhere I read about this they called it ice cream. It had the consistency of ice cream but I thought it was deceiving because it didn't taste like ice cream. You are probably wondering what is the one ingredient....well it's BANANAS! This is a great way to use up bananas. I personally would avoid ones that are very overripe because it's going to taste like overripe bananas which isn't very appetizing. I was amazed at how the bananas just transformed to the consistency of soft serve ice cream. I wasn't crazy about the taste...it tasted like..well...bananas. I think it needed something more but I wanted to share this because I was just amazed at how the bananas transformed. The recipe is quite simple. Slice up a banana and freeze. Once the pieces are frozen dump them into a food processor or blender (I used a food processor) and starting on low whiz away. You will have to scrape down the bowl and at the bottom a few times. Also make sure you keep one hand on your machine. I thought it wasn't going to come together and started thinking why am I doing this...I've just wasted a bunch of bananas. But be patient because eventually it will come together and start to take on the consistency of soft serve ice cream. In half of it I mixed in some chocolate chips for Hasan and he loved it. The funny thing is Hasan doesn't like bananas. When he was younger he would eat one banana a day and then all of sudden he started saying he didn't like them. I didn't tell him this was made of bananas. I just told him it was ice cream and he was happy. He also helped me making it by turning the food processor on and off. If you are not eating all of it right away transfer to a mixer and put in the freezer. I've frozen bananas before, but was too lazy to use a blender. I think it tasted good mashed too, which is what I think I did. To me, bananas are to desserts what celery is to soups... the base, most important ingredient of all. Jibreel won't eat bananas either. I think I might try this on him! It looks really good. Arthi - I hope you do...let me know how it turns out! Rufs - I think I'm going to experiment with this...adding some berries and maybe some low fat cool whip. I think it could be so much more than just bananas. You should make sure you don't toss the book I gave :) It is an amazing book and I know you will love it and want to read it again and again. 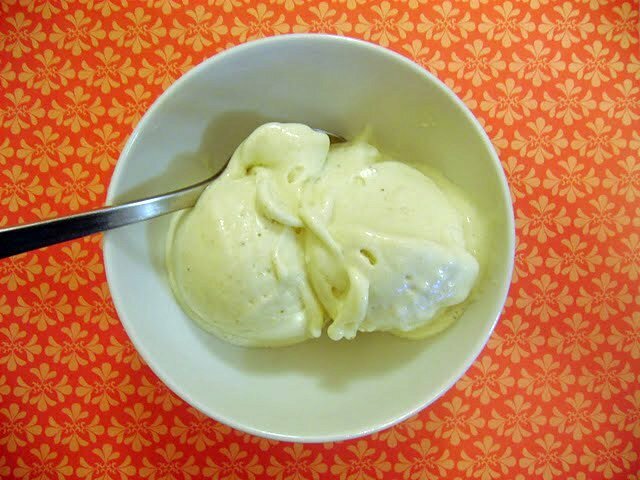 Hi Asiya, I also saw a recipe for this Banana ice cream. Have to admit that it really interested me. Glad to see you tried it out and gave us a review. I would still like to try it as a different way of eating bananas but certainly not replacing ice cream. @ Spicie Foodie: It is definitely no replacement for ice cream :) But I think I'm going to experiment with this to see if I can make it more of an interesting dessert! OMG..this is so so unique & super easy..I have to try this! Wow! Well... that is definitely a healthy ice cream! I can't believe how those bananas turned out! Amazing!